Designed to deliver advanced optic performance, the Sightmark Ultra Shot A-Spec Reflex Sight promises repeatable accuracy and ultra-fast target acquisition for recreational, professional and competition shooting environments. 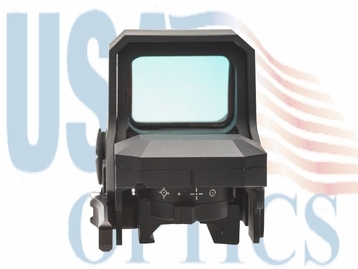 The Ultra Shot A-Spec's premium wide-angle lens system with scratch resistant and anti-reflective red coating, 4 illuminated red reticle options with 10 brightness settings, parallax correction (beyond 10 yards) and unlimited eye relief deliver a crisp, robust field of view and uncompromising reliability, even when perfect sight alignment isn't an option. Built tough, the Ultra Shot A-Spec Reflex Sight is shock proof, IP55 weather-resistant, recoil rated up to .338 and constructed of a rugged, lightweight 6061-T6 aluminum body and protective shield. 1 MOA windage and elevation adjustments, up to 120 MOA of travel, get you on target quickly while the Interlock internal locking adjustment system and a single CR123A battery keeps you there with a battery life of 200 - 2,000 hours. The Ultra Shot A-Spec Reflex Sight also features a low battery indicator, digital switch controls, 1-hour auto shut-off, quick-detach picatinny mount and Sightmark's lifetime warranty. 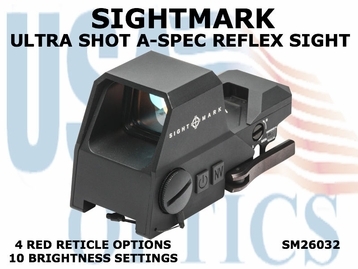 The Ultra Shot A-Spec Reflex Sight is also, perfectly compatible with the Sightmark XT-3 Tactical Magnifier (SM19062). Includes adjustment tools, CR123A battery, operation manual and neoprene cover. Weight, oz - 10.8 oz.